The plant we know as just 'Brachyscome' is a gorgeous little half-hardy annual, often grown as summer bedding in northern Europe as a backdrop to larger, brightly coloured specimens such as roses or tall-stemmed, late blooming tulips. Although there are up to 80 species within the genus the most popular of all is Brachyscome iberidifolia, perhaps more commonly known as the Swan River Daisy. It has an erect habit with deeply cut, pale-green leaves and can grow to a height of approximately 18 inches. 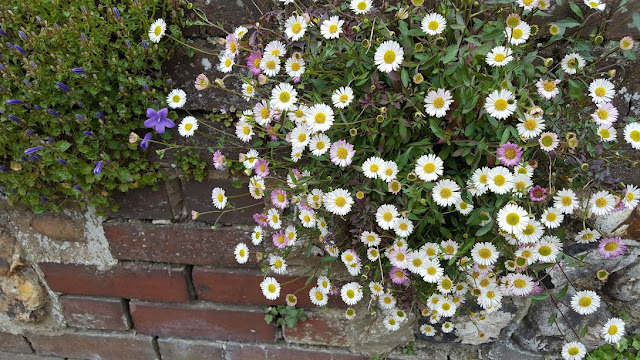 The fragrant flowers are daisy like, 1 1/2 inches across and can range in colour from white to pink, lilac and blue-purple. You can expect Brachyscome iberidifolia to bloom from late-June to September. Native to Western Australia, Brachyscome iberidifolia will thrive in a rich loamy soil, growing in a site that receives as much sun as possible. However it has proven to be both tough and adaptable, capable of providing a good display in even poor or sandy soils. Young plants should be planted out in May and 15 inches apart, but only once the threat of late frosts have passed. Before planting make sure that they have been fully hardened beforehand. Brachyscome iberidifolia can be prone to straggly growth, so for best effect pinch out the growing tips to encourage the formation of side-shoots and plant in close-knit groups so that they can support each other as they grow. Individual specimens may require the support of inconspicuous twiggy sticks. New plants will require regular watering until they establish. Afterwards you will only water during dry periods as Brachyscome is surprisingly drought tolerant. If growing from seed, sow under glass in March, giving a very light covering of compost or vermiculite is required to help initiate germination. Provide a temperature of 18 degrees Celsius and you can expect the seedlings to emerge in 10-15 days. Once established reduce the temperature to 16 degrees Celsius after pricking out. Alternatively, sow Brachyscome directly in their final position in April and then thin out to their required spacing. If cold weather is expected then provide the protection of a cloche.